Most everyone likes watching videos online, which is why Swagbuck TV is so great. With over over 15 different categories and over countless videos, there is bound to be something you’ll enjoy watching (everything from celebrity gossip to technology reviews and health tips). One nice thing about Watch is that you know exactly how many points you will earn and how long it will take. When you open the Watch page there will be a menu on the left to select different categories. Browse through the list, find one you like, and click on it to play. If you don’t see the video, make sure flash player is updated and that any ad blocking software is disabled. 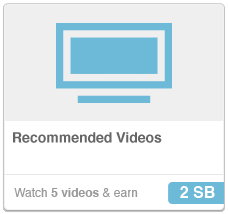 Below the video is a blue bar showing how close you are to completing and a list of the videos that you have to watch to earn the listed SB. For those of you who have a android smart phone, you might be interested in downloading the Swagbucks TV mobile app. (You can also find the link under the Swagbucks TV page). The mobile app is different from the web version of Swagbucks Watch and you can watch videos that are not available on the Swagbucks Watch webpage. It’s simple, and it’s a great way to earn more Swag Bucks!